The Mecum auction in Harrisburg, Pennsylvania has over 1,000 vehicles up for grabs. Yet ESM’s editor is enthralled by one of the least fashionable cars in the catalogue. It looks like a basking shark with those gills behind the front wheels, and is a similar size to the average ocean-going Cetorhinidae. Smattered with motoring chintz from the 1970s, with concealed headlights, vinyl roof and opera windows, this is far removed from what we consider cool or luxurious today. Yet I love it. 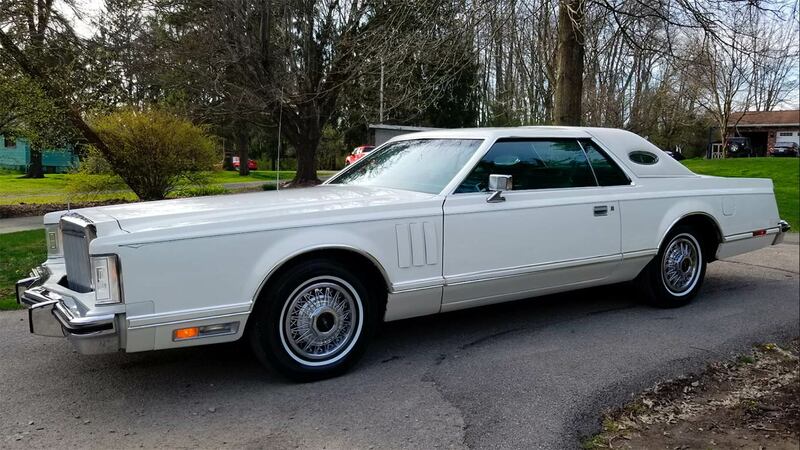 I truly love this Lincoln Mark V, for the sheer excess and ridiculousness of it all. The ‘personal luxury car’ sector was an American affliction, emphasising the importance of driver comfort and convenience at the expense of everything else. Derived from bespoke creations by the likes of Delahaye and Dusenburg in the pre-war years, it was Ford who brought personal luxury to the mass market with the 1955 Thunderbird. Chevrolet would introduce the original C1 Corvette as a competitor to the Thunderbird, but the ‘Vette would evolve to take a different route. As such, it was Ford who would dominate the personal luxury car segment, until the 1970s saw the competition increase overnight. Yet the Lincoln Continental Mark series was still the benchmark to judge others by. The criteria for judging a successful personal luxury car differed to many automotive norms. Handling and performance were tertiary ideas, far behind driver comfort and the perceived image of wealth. 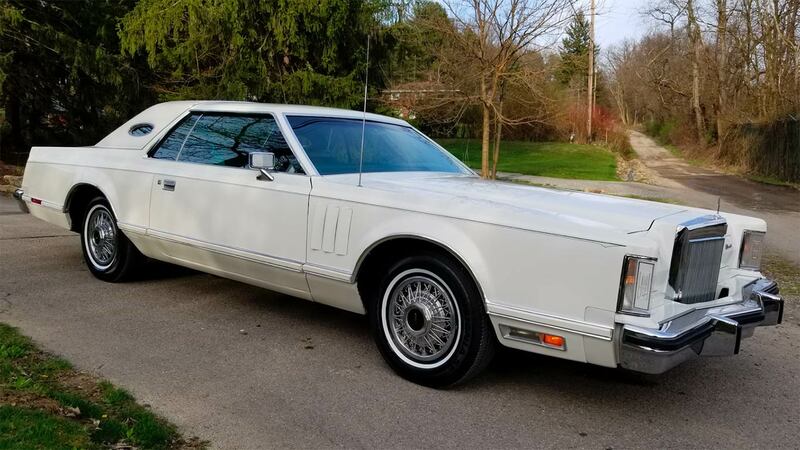 How else could Ford have gotten away with selling the 1978 Diamond Jubilee Edition of the Continental Mark V? The limited edition added $8,000 to the existing $13,000 price tag, making it the most expensive car in the Ford range. Adjusted for inflation, $21,000 would be around $80,000 today. Our car featured here sadly is not a Diamond Jubilee Edition, meaning the original owner missed out on the chance to request the Ford Diamond Jubilee Recipe Collection book. We can only imagine how upset they were to lose out…. Yet we do apparently have a rare colour combination, with only 71 other buyers opting for the white on white paintwork and landau vinyl roof choice. Oh, and then there’s the glorious teal velour upholstery inside – an acquired taste even in the late 1970s! Power comes from a gigantic 400-cubic inch (6.6-litre) V8 engine, but don’t get carried away expecting muscle car outputs. Fuel economy restrictions meant the 400 V8 could muster just 166hp, although torque was more respectable at 319lb-ft. A three-speed automatic gearbox was the only transmission on offer. Performance was also relatively underwhelming, with 0-60mph taking a lengthy 11.8 seconds. It would make the Mark V driver fair game for virtually everyone at traffic lights. 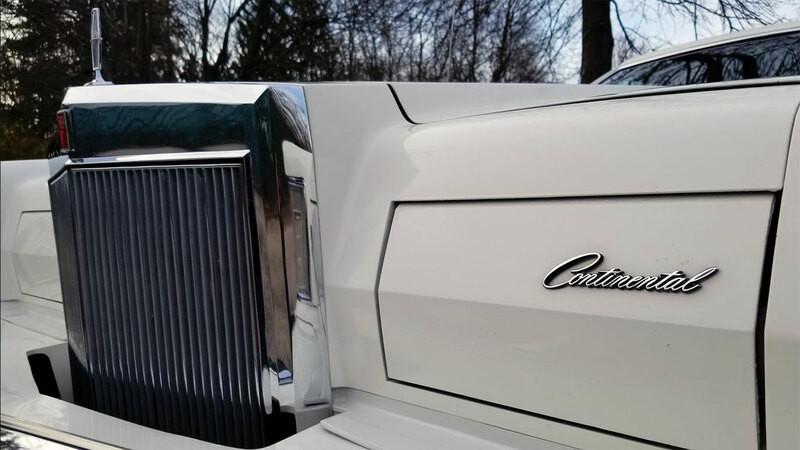 The only bonus is that with miles per gallon that would struggle to break mid-teens, the Continental would drain its tank relatively quickly. That would at least take away some of the 5,020-lb (2,277kg) kerb weight. An almost total absence of dynamic prowess, combined with a wallet-destroying thirst, means that taking it on the road would seem pointless. At over 230-inches (5.8 metres long), and 79-inches (2.02 metres) wide, attempting to navigate Britain’s roads in it would be a nightmarish proposition anyway. So we’re left with a vast vehicle that was poor to drive even when new, is too big for this country, and suffers from an image problem. Yet I still want it. This Mark V encapsulates the extravagance of American motoring excess, and ticks almost every 1970’s cliché along the way. And let’s not forget that interior. I want it solely to park on the drive and look at. To lounge across the bench seats, and to try to find 8-track tapes to play on the sound system. If only the first buyer had specified the optional CB radio. Some research throws up that Continental Mark V models like these hardly command big money at auction. Values range between $10,000 to $30,000 (£7,600 to £23,000) making the Mark V seem reasonable for the amount of metal on offer. Whoever buys this at next weekend’s Mecum Auction is going to be very happy with the amount of vinyl and velour clad real estate they take home. Previous Post BTCC 2018 | What happened last time out at Croft? Next Post BTCC 2018 | What happened last time out at Snetterton?